Shell Pearls of Matsuwaka | Matsuwaka Glass and Pearl Works Corporation. Matsuwaka shell pearls are made of freshwater mussel (Hyriopsis schlegelii), which are found in freshwater environments such as ponds or lakes. Being sufficiently thick and beautifully colored, freshwater mussels are perfect cores for our shell pearls. The smooth and natural texture has won the approval of many women. The land of Izumi saw its first imitation pearl in the Taisho Period, where milky white glass beads were coated with pearl essence extracted from the scales of largehead hairtails. This was followed by the introduction of imitation pearls using shells as cores, in lieu of glass beads. Today, imitation pearls made in Izumi City account for over 80 percent in domestic shares. Widely in demand both domestically and internationally, our quintessentially MADE IN JAPAN quality has won the appraisals of many. At Matsuwaka Glass and Pearl Works Corporation, we carefully cut and shape the shells of freshwater mussels over a number of phases to form a spherical core, which is then coated on the surface with a variety of colors to bring about the gloss and sheer. Coloring work warrants the highest set of skills among the numerous steps of producing imitation pearls. 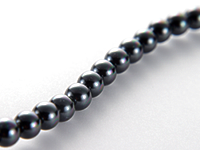 The coloring process adopted at our company starts by threading the core beads with a wire and setting them into a frame at equidistant so that each and every part comes into contact with the coloring solution. Next, the frame is soaked inside a vat filled with coloring solution to evenly apply color to the core beads. 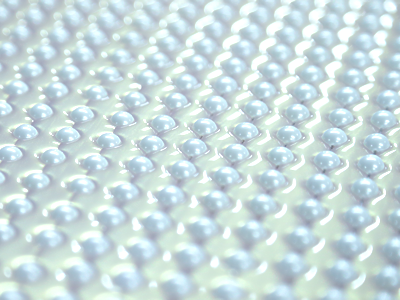 By using our specially ordered pearl polishing device in the final stage to polish the beads gently as if taking care of one’s own skin, an iridescent, multicolor shine is achieved. These beads come in a plethora of colors including white, grey, blue, pink, and orange, totaling over 100 varieties if counting the subtle shades. The color of the shell core slightly tints the color of the coating, producing a breathtakingly beautiful effect. We are the sole company in the country that oversees the entire process of coating to polishing, with the orchestrated teamwork among our craftsmen enabling mass production. 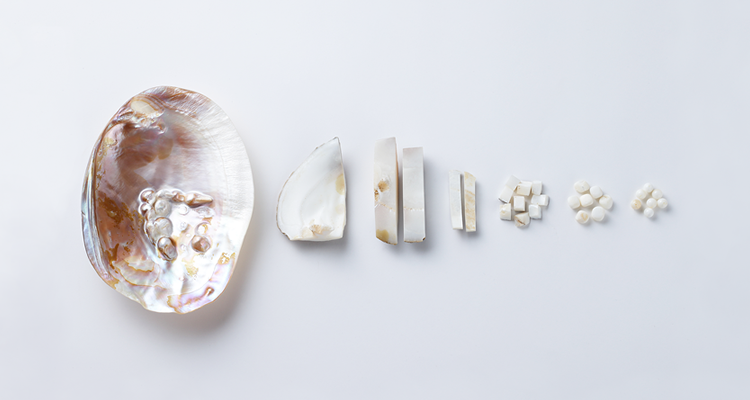 Founded in the land of Izumi and growing at pace with the local community, Matsuwaka Glass and Pearl Works cherish shell pearls as its signature product. Needless to mention the beauty of their appearance, resistance to oil, sweat, and stains, which enable our customers to user our products over a long period of time without worrying about degradation of quality, are also characteristics to which we pay attention. As formal accessories with class and simple beauty for ceremonial events, or as casual complements to add a dazzling, feminine touch to your everyday style, Matsuwaka offers first class imitation pearls that bring you iridescent shine. Let us know of any individual needs and we will be happy to tailor a product based on your needs and budget. 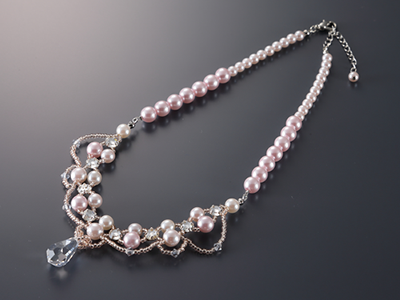 A gracious necklace to dress a lady's décolletage comes into mind when we imagine pearls. At Matsuwaka Glass and Pearl Works, we are ready with a rich selection of pearls of different sizes and colors so that we can design one-of-a-kind products tailored to each customer's preferences. Be it the length of the chain or accessory parts like beads, charms, and glass beads, let your imagination run free. We also offer magnetic clasps and other ways to make your accessory more suitable for daily use. Aside from necklaces, our assortment includes various fashion accessories such as earrings, piercings, tiepins, cuffs, and hair ornaments. Fashion and cosmetics are also areas in which we explore the possibilities of our pearls. Our shell pearls are a registered trademark. 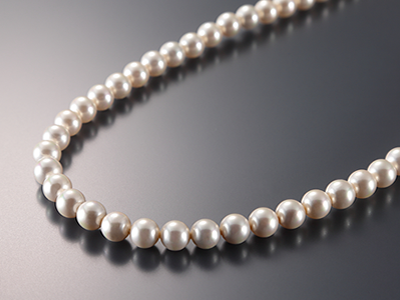 Our pearls are made in Japan. We hope you will take great pleasure in using our quality products. 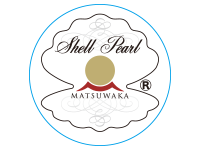 Matsuwaka Shell Pearls Are AUTHENTIC, DOMESTICALLY PRODUCED PRODUCTS With High Brand Value. The system enables certification of products that were made from domestically produced materials, and were also dyed/processed and sewn/woven in Japan. While the old system allowed products to be labeled as Made in Japan if the final step was performed in Japan, the new system sets forth a stricter requirement by mandating that that all three steps be performed domestically. 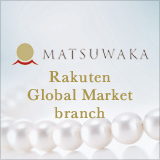 Matsuwaka shell pearls are undoubtedly authentic, Made-in-Japan products. We perform the entire process of shaping, painting, polishing, and touch-up domestically. Needless to say, we also fully honor the two other conditions judged when applying for certification: "passion for creation" and "detailed and precise craftsmanship". Matsuwaka Glass and Pearl Works pride ourselves in presenting quality and value that fully embodies the significance of a Made-in-Japan product. Copyright © Matsuwaka Glass and Pearl Works Corporation. All rights reserved. © Matsuwaka Glass and Pearl Works Corporation. All rights reserved.